The Marafiki Directory is maintained by Erika Davis-Pitre. If you would like to be included in The Marafiki Directory, please send your name, contact information, names and ages of your children and any interests and activities to Erica Davis Pitre. Please write Marafiki Directory in the subject heading. Be sure to mention if you are willing to host travelers for daytrips and/or overnight stays. If you operate a businesses or head an organization, and would like to have your banner appear, please check out our advertising options. "Marafiki" is Kiswahili for "Friends" and this directory is for homeschool parents and students to meet and connect. Please remember that we cannot control how The Marafiki Directory is used; if you receive any unwanted mail as a result of being listed, just delete, throw it out or even better, recycle it! We live in South Florida and would love to hear from other families. 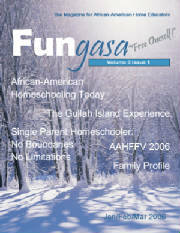 Is forming a group for homeschooling parents in the metro Detroit area. The group(NCAAHA) is headed to San Diego to Legoland on Monday, March 27th. They would like to officially invite any AfAmUnschoolers to join them. Most of them will be in the area for the weekend before that Monday so would love to hookup with others for other San Diego attractions as well. Stacie is willing to provide her email as the contact stacie_brazil@yahoo.com and hopes that anyone in the area who might be interested, let her know and she'll keep them updated on specifics of the trip. Homeschooling Jasmine (1994) and Buddy (1997). five children ages 11, 10, 7, 2 and 4 months. We would love to hear from other families. Yes, I'm interested in knowing some unschooler members in my area. I would be interested in hosting a field trip. Frederick Maryland area (near the borders of both Howard and Montgomery Counties). Children: 2 boys age 14 and 15. Is willing to plan and/or host day trips and would love to get her kids together with other AA high schoolers for day trips. Also is willing drive to meet others within the metro area.